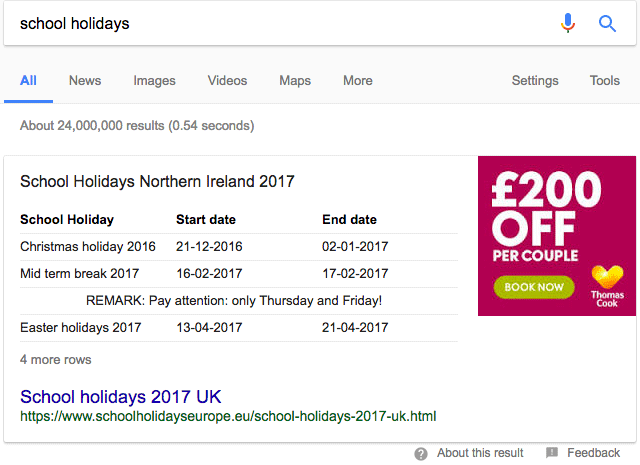 Go to Google and search for [school holidays] and at the top you will see a featured snippet, which now includes both the textual answer and an image. If you see what I do, you will see that the image promotes €200 off a vacation package. The interesting part, if you go to the page where the image is, you will see a very text heavy page around UK based school holiday dates. There is an image ad in the middle that takes you to an advertiser. I doubt, but who knows, that this featured snippet spam was intentional. I wonder if we will see an influx of these attempts to spam the graphic used on the featured snippets?